What do you do when your backs against the wall, you’ve got nowhere or no-one to turn to and the whole world is convinced that you’re a cold-blooded, homicidal lunatic? You do the only thing that you can do. Reload, refocus, keep your head down and do whatever it is you have to in order to make it through the day and keep your loved ones safe. 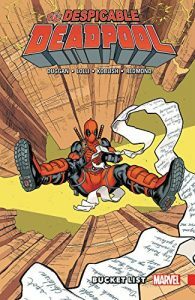 Out of options and blackmailed into murderous servitude by Stryfe, who holds Wade’s daughters life in his hands, in Bucket List Deadpool continues to work his way through the six strong kill list that his “employer” has handed him. From Cable’s on-off girlfriend, to the future Apocalypse and a middle aged woman who is seemingly unconnected to anyone, Deadpool is forced to keep filling body-bags if he wants to keep his daughter alive, a bargain that he finds increasingly hard to keep the closer it gets to completion. It’s never easy being Deadpool, but in Bucket List it’s made even more difficult when his former comrades in arms and friends, and the one man he used respect more than anyone else in the world, all try to take him down and make him answer for what he’s done. And talking of that chap who used to mean everything to Deadpool, Wade decides it’s time to pay his Hydra loving former commander in chief a visit in the maximum security hoosegow in which he now resides in an attempt to try and get some sort of clarity from, and a modicum of revenge upon, the man who turned his life upside down, inside out and transformed him into public enemy number one. Which, as with most things in Wade’s life, doesn’t end well. But when the house keeps dealing you a losing hand, sometimes all you can do is hang on in there until the lights finally go out. And that’s what Wade, stripped of almost everything that he cares about, vows to do even though he knows, as do his chums on the other side of the fourth wall, that when it does come, the end isn’t going to be pretty and it certainly won’t be quick or peaceful.